The Camellias are showcased with cute little applecrabs, which are a cross between a crabapple and a domesticated apple that are grown in the Cuyama Valley near a National Forrest by Santa Barbara, California. They are organic, tart, and delicious, and I ate one of the three bags that I bought, carefully...all but the seeds. 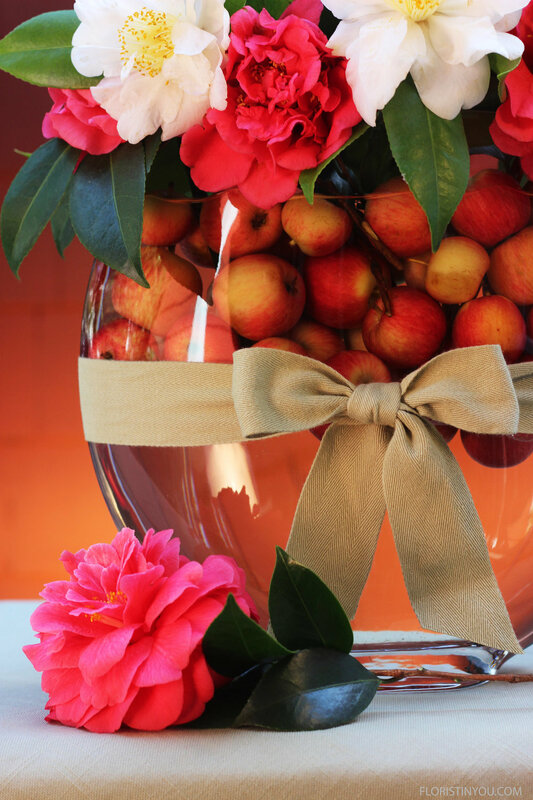 Yum, but they do make adorable vase fillers, just change the water once a day unless you want apple cider. If you have your oval vase, (found here) which is a very versatile vase and one of my favorites, your camellias and your applecrabs or crabapples, whichever you prefer, you are ready to make this arrangement. Here are your flowers and supplies. Wash leaves. Careful. Don't get the blooms wet. Dry the leaves. If stem's too short wire it to a pick from the top of the bloom. Wrap floral tape around first 2 inches of stem. Tear tape to finish. Add water to 2 inches below rim of vase. Add a stem of leaves angeling down on each side. Tie ribbon tight in knot, then a bow. Cut edges on 45 with sharp fabric scissors. Here's c close up of these beauties.